Reading this passage, we can observe that Great Shinjin (Great Trust) transcends all dichotomies and dualities based on the religious teachings current in Shinran’s time. He describes here a faith beyond labels, beyond criteria or definition. In our ordinary way of thinking, we distinguish one thing from another. We are essentially analytical in distinguishing all aspects of our world and relationships. Discrimination, polarities, contrasts or dualities are the source of prejudice as we opt for one side or another. Though it is natural for humans to make such distinctions, they have no relevance for the reality and experience of true entrusting or Great Shinjin. Shinran is telling us that Amida Buddha embraces all beings or relationships through true entrusting. There is equal access to Amida’s compassion and wisdom no matter what the position, label, designation or definition we bear in society. We might add here, in our modern times, nationality-ethnic identity, race-skin color, or gender orientation (gay, straight, bi-sexual or transgendered), distinctions that Shinran had no knowledge of. Shinran rejects natural or socially imposed distinctions as having any relevance for determining true entrusting. Moral virtue or achievements in religious practices are of no significance. While such distinctions are a part of our social and cultural lives, true entrusting and spiritual meaning transcend them. Great teachers in Pure Land history are revered their piety expressed in reciting the nembutsu as many as 60 or 70 thousand times a day. We do not know how many times Shinran chanted it. The number is not significant. Considerations of time, when or where, or the amount of practice have no place. Tradition maintains that the nembutsu should be constantly recited whether one is sitting, standing, walking or lying down. Shinran’s most radical statement in view of Buddhist teaching and history, declares that true entrusting is not defined by right or wrong Contemplation (Meditation). We may recall that Right Contemplation is one of the requirements to gain enlightenment in the Eightfold Noble Path set out by Sakyamuni Buddha. A major implication of Shinran’s statement is that true entrusting is deeply personal and inward. Although he writes from within the context of Buddhism and Japanese society, the meaning and implication of his writing is universal, highlighting the reality of the person. Would it be too much to say that for the first time in Japanese history, Shinran discovered and experienced his reality as a person? His personal emphasis is striking in his various confessions of spiritual limitations, particularly since Japanese culture has been noted for its communal character where the individual is representative of the group, without independent status. Shinran declared that Amida’s vow of unconditional salvation was made for him alone (Tannisho Epilogue). He often stated his personal views, declaring “As for me Shinran…” He declared that even though you might be accused of being a cattle thief, do not put on airs like a seeker of the afterlife. We are not to be controlled by appearances. Rennyo, the Eighth Abbot, later declared: “Hence, we know that outward appearance is uncalled-for; the One Mind is essential. People of the world say, “Even if the hair is shaven, the mind remains unshaven.” (Rennyo goichidai kikigaki 25). True entrusting is not measured by externals, but by how deeply we are committed in our own minds. Shinran valued spirit over form. Shinran’s rejection of external criteria to judge a person’s entrusting or faith implies that we should not seek reality outside or apart from ourselves. Religious traditions, however, objectify and externalize spiritual reality. Hence people find their spiritual security believing in systems of doctrine, performing rituals, and heeding hierarchies of control. Buddhism from its beginning has stressed the delusory nature of the external world. In the Zen tradition there is the challenge, if you meet the Buddha, kill him. That is, you must discard the thought of the Buddha as something outside yourself. In popular Pure Land teaching there has been a tendency to think of the Pure Land as an actually existing world, for instance the Sutra describes it as inconceivably distant from this world to the west. Amida Buddha comes from there to meet believers and welcome them to the Pure Land. According to teachers, such descriptions are upaya, that is, they are compassionate means to encourage the spiritually undeveloped to progress in their understanding of the teaching. Amida Buddha is not one Buddha among other Buddhas. Shinran understood Amida Buddha as the supreme reality which embraces all beings and is our true self with. According to Shinran, Amida is the upaya-compassionate means by which we know inconceivable, formless reality as it is. Shinran’s rejection of external criteria measuring true entrusting correlates with Amida as our deepest inner reality which expresses itself in our aspiration for a higher life, for truth, for meaning. In traditional Buddhist terms, true entrusting is the expression of Buddha nature. 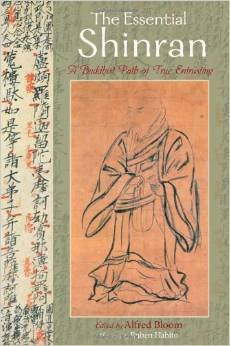 Great Shinjin, true entrusting is the realization of Amida’s true mind within our heart-mind. The rejection of external criteria for measuring other people’s faith means also to reject control over other people. With no external criteria, no institution can claim to judge who has or does not have it. No individual can judge anoth er.We no longer have means to judge another person’s spiritual status. Shin Buddhism offers spiritual liberation and advocates a spiritual brotherhood, a fellowship of equal companions in practicing the faith (dobo-dogyo). Hierarchy and elitism that marks religion generally is absent from Shinran’s teaching and is clear when he declares that he has no disciples and refuses to excommunicate a follower (Tannisho). He refused to excommunicate an errant disciple, because, as he said, it is Amida Buddha who has given faith to both Shinran and the disciple. Therefore, it was not for Shinran to take back. Shinran’s statement in “the Ocean of Great Trust” is perhaps one of the most remarkable and radical in the history of Buddhism and religion. It is based on the principle of absolute Other-Power which is the foundation of Shinran’s reinterpretation of Buddhism and Pure Land teaching. The Ocean of Great Trust (Shinjin) is the mind of truth of Amida. This mind embraces all reality and is experienced in the power of growth, creativity, the urge to transcend in all life, the aspiration for truth and realization in the human spirit. We are always floating, swimming and living in this sea. The Ocean of Great Trust is the foundation of life. We live by trust; there is no activity or life situation that does not involve trust. We trust the regularities of nature; all of our human relations are grounded in trust. Without trust we would be cowering in fear or avoiding encounters with others or hiding in shadows to be unobserved and inconspicuous. Fear would govern our lives. We cannot have stable relationships without trust; otherwise suspicion would reign. Only the person who experiences the Ocean of Great Trust can know that he/she has been embraced by the Buddha. Religious faith is highly personal and inward. It presents a spiritual koan or paradox expressed as in the Zen question: What is the taste of a drink of cold water? How do we describe the deepest reality of our own lives? The context of Shinran’s statement is the discussion of the True Disciple in the volume on Faith-Trust in the Kyogyoshinsho, Shinran’s major writing, outlining his understanding of Pure Land teaching. What constitutes a true disciple? The true disciple is the person who discovers the reality of Amida’s vow working in his/her own life.